Despite the fact that NASA scientists are among the foremost promoters of catastrophic global warming due to man's use of fossil fuels and carbon dioxide emissions, NASA scientists have long known that the moon exhibits a warming effect which is similar to the effect which on Earth is said to be due to greenhouse gases. Calculations in anticipation of the Moon Landings indicated that such a net warming effect should be expected and subsequent measurements on the moon's surface during landings confirmed this effect. What is this effect due to? We will discuss that below, but let us first examine the greenhouse effect. It is commonly claimed that the Earth can be treated as a black body which is in equilibrium with the incoming radiation of the sun and the outgoing radiation into space from the black body Earth. Calculations based on this simple model indicate the Earth has an average temperature 33C warmer than it should be. It is said to be this much warmer due to its atmosphere, in particular due to water vapor primarily and other greenhouse gases such as CO2 secondarily. A black body absorbs 100% of the energy that falls upon it and it re-emits energy based on the Stefan-Boltzmann formula. When the black body is in thermal equilibrium, it emits energy at the same rate as energy is absorbed. The theory assumes the outer surface of the black body is extremely thin, though this matters little to the calculation provided the underlying material has a fixed temperature gradient with the maximum temperature on the outside surface and a radiation absorption length which is extremely short. For the surface depth to be unimportant, the amount of radiation falling on the surface should also not be changing in time. These are not conditions satisfied by the moon or the Earth. The moon surface heats up when radiation from the sun is incident upon it and that heat is conducted downward into the rock and dust of the moon surface. The local topography of the surface, the distribution of rock and dust minerals, and the local particle sizes will all affect the local depth to which heat will penetrate, the absorptivity of the surface, and the emissivity of the surface. In addition, the moon rotates so that the amount of energy from the sun, or reflected from Earth, varies over time upon a given area. Thus, the gradient of energy below the surface will change as the surface cools when sunlight is not incident on it. This sub-surface heat reservoir acts to warm the surface. This introduces a heat convection source, which is not consistent with a black body radiation source. The situation with the Earth is much worse. All of the problems of the moon exist for the Earth. To which are added the fact that the Earth has a substantial atmosphere in which the radiation absorption length is long. Large thermal gradients will exist in the atmosphere even if it were of uniform composition. It is not. The most important way in which is not is the wide variation of water vapor in it, and still worse, the wide variations in cloud cover. 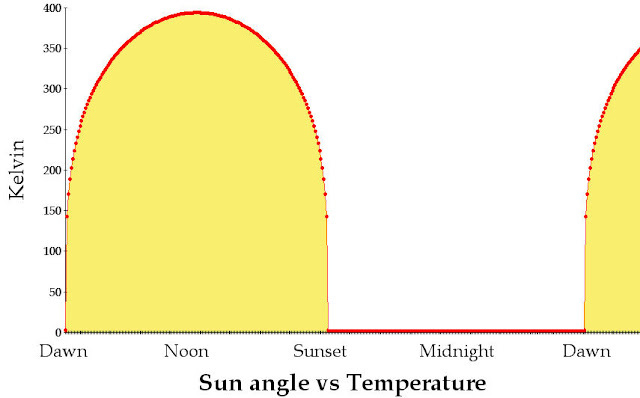 The absorptivity of the atmosphere for solar radiation varies from place to place, as does the emissivity. Compared to the moon, the Earth's surface also has a great variability in the important properties of absorptivity and emissivity from area to area. The South Pacific is different than the Rocky Mountains, Antarctica is different than the Great Plains, the Siberian tundra is different than the Sahara or the Amazon rain forest. These differences alone would create great flows of heat in convection currents even if the Earth did not rotate. In addition, there is much more variation in the depth to which heat will be absorbed in the land areas than on the moon due to more varied compositions. Then, the oceans and water bodies hold very large amounts of energy which is absorbed to comparative large depths straight from incoming radiation and then further distributed in convection currents to great depths and over large lateral distances. All of these large heat flows on Earth cause it to fit the requirements of a black body radiator very poorly. When no radiation is incident upon the spot on the surface, the temperature falls to absolute zero! A later calculation took into account some light reflected from Earth when sunlight was not incident. Under that condition, the low temperature was between 30 and 40 Kelvin. But the moon does absorb heat for some depth into its surface and that heat flows to the outer surface as the outer surface cools at "night." So, what did NASA find the temperature profile over the course of day and night to be? The maximum temperature of the day is no longer noon, since at noon the rock and dust has not yet reached the maximum degree of sub-surface warming. The maximum temperature is actually afternoon, just as it tends to be on Earth. 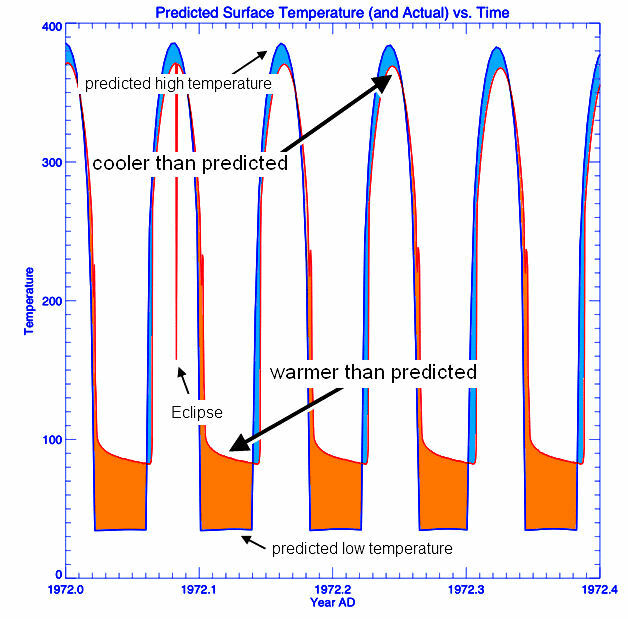 The blue areas in the graph show when the surface temperature is cooler than in the simple black body calculation in the first graph, while the orange areas show when the temperature is warmer. Early in the day, the surface temperature is cooler because surface energy is flowing more rapidly into the cooler sub-surface rock and dust. Late in the day and through the night, the temperature is higher than expected by the black body calculation because heat is flowing to the surface from the sub-surface. The average temperature is raised considerably, because while there is a slight depression of the maximum temperature in the day, there is large increase in the nighttime temperature. By day the average temperature is cooler by 20C, but at night it is warmer by 60C. The average temperature is raised 40C! If the moon had an atmosphere, this would be called the greenhouse effect. Because the Earth has an atmosphere and because it has oceans over 70% of its surface and the oceans retain huge reservoirs of heat, the variation in temperature throughout a day is much less on Earth than on the moon. But, there is still a rise in the average temperature due to heat convection on land, in the oceans, and in the atmosphere. Heat convection in 3-dimensions creates an effect that looks like the greenhouse effect. Similar effects are observed for all of the planets. It appears that if any "greenhouse effect" occurs due to CO2 in our atmosphere, that effect is very small compared to the 3-dimensional effects of distributed heat with convection heat transfer. That this is so has long been known by NASA, which nonetheless has played a very major role in the promotion of AGW alarmism on the basis of greenhouse gases! Once again, we find that government is not worthy of our trust. It has promoted terrible damage to our economy on the basis of this greenhouse gas catastrophic warming nonsense. It has been willing to put companies and many employees out of business. It has been happy to promote programs for alternative energy that greatly increase our energy costs and threaten to degrade the quality of our energy systems in use. It has declared CO2 a pollutant and is about to start draconian regulations at great expense, with huge additions to the bureaucracy, and terrible hours of additional paperwork, expert fees, and lawyer fees for many, many companies. Cap and trade schemes have been put forth in its name which will enrich the politically connected, while the average family sees its energy bill go up between $1,700 and $3,500 a year. As Obama says, our energy costs will necessarily skyrocket. Obama may be fine with skyrocketing energy costs, but you and I should be very angry about it. Not only is the basis in CO2 greenhouse gas theory all wrong, but none of the remediation schemes are even thought likely to benefit the climate in any significant way. Even if the greenhouse effect were substantial, which it is not, all of the energy use restrictions are all pain and no gain. Are we all suddenly masochists? Don't we all have lives to live, places to go, and things we want to make or own? What is this madness that has overcome so many of us? Well, for some it is simple robbery. There are those who are very happy to take advantage of the fact that most people and most Americans in particular, do not know enough science to understand how badly the wool has been pulled over their eyes. There are no two ways about this. The catastrophic man-made global warming scare has been a massive fraud. There are many very evil people promoting this fraud and most of the impetus for it is coming from Democrats. It is very important to make them pay in the elections of 2010 and 2012. Great article. However, you run the risk of being labelled a denier and added to a blacklist of scientists for telling the truth. With Global Warming it is not the truth that matters, but what the cabal of groupthink alarmist scientists dictates. I am a denier of catastrophic anthropogenic global warming. It causes me no fear. It does disappoint me that our educated elite are not as bright and independent-minded as they should be. I also defy the ever-popular cause of big brother government among the college-educated, especially among those with advanced degrees. It causes me no fear. It does disappoint me that our educated elite so despise most other Americans that they think them incapable of choosing their own values and managing their own lives in accordance with their own values. The hubris and ignorance of the elite to think they can do a better job of this than the individual is mind-boggling. There is no better feeling than that of being a champion of reality. It is a great pleasure to understand and marvel at reality, though one may be shunned by those who shrink their minds into dark pockets of group think. Group think in humans has an analog in the physical universe: It is the black hole. By the way, because I signed the Senate Minority Report on Catastrophic Global Warming, I have been called out as an unqualified scientist many times. In one case I was said to be unqualified because I was a biologist, which is one type of scientist my multi-disciplinary career would never allow me to come close to describing myself as being. In other cases, catastrophic AGW people have questioned that I had a Ph.D. Apparently a requirement for a Ph.D. now is thought to be that one must be a qualified group thinker! I have also been told that I must be a NASCAR enthusiast, a right to lifer, a racist, a redneck, trailer trash, a flat-earther, an intelligent design advocate, and a wealth of other things based on no more information than that I evaluated catastrophic AGW as wrong. What could make it more obvious that belief in catastrophic AGW is a part of the indivisible catechism of the educated elite? In the realm of "unknown unknowns", alarmism is easily harnessed along with greed and the opportunists. Hence the cult of Catastrophic AGW (CAGW) and the carbon trading opportunists. So the moon's surface absorbs heat and re-emits it. That is in no way a greenhouse effect. If you are going to be a denier, at least start with real science. Thanks for both of my last two commentors for their encouragement. Praise and love are appreciated. It is great to have something to put on the scale to balance out the hate of the man-haters among the environmentalists and some of the socialists. The good stuff is more important because more rational people are more important! Make that the next to the last two now. Neither I nor Hertzberg, Siddons, and Schreuder were claiming that the moon is experiencing a greenhouse effect. What they were clearly saying is that there is an effect on the moon, which has no atmosphere, which is also an effect on earth. But on earth, the effect is mistakenly attributed to the greenhouse gas effect. You will really get a kick in the head from the post I have just put up on 30 June 2010! Great a physicist commenting on climate science. I'd like to make 2 points. Firstly - the effect seen on the moon and applicable no doubt to most such bodies including earth, does not lead to the conclusion other effects are not taking place. Secondly - there are people on both sides of this debate who resort to hate language, and in either case I believe it is unacceptable. One of my great concerns regarding current debate is it appears to be creating a large divide fueled by intolerance and often ignorance, that is leading to more and more hate talk, and this is a very bad thing. It is up to all reasonable people, whatever side of this issue they are on, to denounce intolerance and hate. Don't go bothering NASA with this trifling matter; they've clearly got more important things to focus on. The effect on the Moon repeats in Mars, where the temperature should be 5-6 K below the temperature it actually has. There is no way of explanation to this phenomenon on Mars because the carbon dioxide mass fraction and partial pressure is not enough as for maintaining that warming effect. I have made some simple calculations on the solar EMRP exerted on the Earth's surface and found that the "warming of the surface by downwelling radiation from the atmosphere" is a complete myth. Is it better to have a climatologist who does not understand physics posting on long-term climate effects? It appears clear that most of the controlling IPCC "climatologists" do not understand physics and such basic tenets of scientific epistemology as the fact that when your hypothesis predicts a core phenomena and that phenomena does not occur, then the hypothesis is wrong. The link in your post does not work, so I do not know which more important thing NASA has to worry about. Thanks for your comment. I have not examined the case of Mars, myself, but I understand from others also that CO2 does not play a significant role there. As of the down-welling of radiation, we agree. "It appears that if any "greenhouse effect" occurs due to CO2 in our atmosphere, that effect is very small compared to the 3-dimensional effects of distributed heat with convection heat transfer. That this is so has long been known by NASA, which nonetheless has played a very major role in the promotion of AGW alarmism on the basis of greenhouse gases!" Since none of this impinges on AGW theory, it's a bit hard to see what the fuss is about. You'll have a very hard time showing much radiative absorption and reradiation beneath the lunar surface. This last short comment seems to be saying that the fact that there is a net warming of the moon due to the heat capacity of the surface and the time delays in heat transfer through those surface layers has nothing to do with AGW hypotheses based on the emission of IR radiation from the surface adsorbed by CO2 gas. But, in the case of the Earth, all of the net warming due to the heat capacity of the surface, the atmosphere, and the oceans is attributed by AGW theorists to CO2 IR absorption effects. Clearly this is not the case and the moon situation shows that, while giving us every reason to believe that the effect on Earth of surface material heat capacities will be even greater. Note also that the comment implies that the AGW theory only examines the effects believed to occur upon surface IR emissions due to CO2 absorption and re-emission. They do not consider the effects of CO2 in absorbing IR coming directly from the sun and thereby preventing energy from reaching the surface. On the incoming solar radiation side there is a cooling effect relative to the ground and on the ground emission side there is supposed to be a warming effect. There is no attempt to examine the balance of the two effects. Very nice blog and good discussion about the moon. There are however some unanswered questions concerning the thermal impact of an atmosphere, and now I'm not talking about some mysterious effect arising from IR-active trace gases. If we have a look at Venus for example, we observe a huge surface temperature. Going further out in the solar system we find the gas giant Jupiter. Since Jupiter is a gas planet it doesn't even have a well-defined surface and as we move deeper into it the temperature eventually rises to levels far above the earth surface temperature. Are you aware of any physical models that explain this phenomena? Apparently pressure and temperature seems to follow each other but nobody seems to be able to explain it. You are very right to point to the effect of adiabatic heating of a gas as its pressure builds up. This effect has long been known to deep miners, for instance. Suppose you open a shaft 2 miles deep into the earth. The gas pressure at the bottom of the shaft is much higher than that at the surface of the Earth. Now right at its opening, the temperature is near that of the surrounding ground, but each delta V of volume of gas as you go deeper into the shaft will have an increasing temperature just due to the building pressure. If P is pressure, V is our delta V volume, n is a mole of gas based on the composition of the gas, and R is a constant, the ideal gas law says PV=nRT, where T is the temperature in Kelvin. So T = (PV)/nR. Since the pressure is increasing and we take each delta volume the same size, the temperature increases as we go deeper. Of course, it might not at first since the ground around the shaft itself may be cooler for a while and it will cool the gas in the shaft. But, that effect will stop as the interior Earth temperature starts to rise and to that is added this adiabatic gas pressure effect. In any case, deep miners have to account for this effect. Applying this to a planet, especially a gas planet, we have to balance the gravity pulling the gases into a dense atmosphere against the PV=nRT formula where the constant R assumes a constant gravity. Over large distances that will not be true. So in Jupiter the heated gas wants to expand and will create an equilibrium with the force of gravity which tries to compact the gases. In Jupiter's case, the heat of radioactivity is also an actor in this equilibrium. This is an effect I should discuss at greater length in the future. It does provide a heating effect in our atmosphere as well. Thanks again. Thank you for your answer. Good that you brought up the deep mines, I guess those could provide a good environment for controlled experiments. Obviously the empirical evidence points in the direction of important pressure effects on temperature, at least those reported by thermometers. The significance of the temperature gradient as such is of great importance to the greenhouse theory as I will try to explain. First of all, the theory not only predicts an increasing surface temperature as a result of increasing GHGs but also a cooling of the stratosphere. Obviously such a conjecture is not in harmony with the assumption of an adiabatic temperature gradient existing independently of any GHGs. The ideal gas formula is suggestive, however, there is a subtle complication in the density n. In theory it could adjust to the barometric shape so as to keep the temperature constant. There are a lot of things to say about this, but in order to keep this post short i attach some links that I think captures the essence of the problem, and I look forward to further discussions on the issue. Regards. Here is something of great importance. Back in 1976, before the major politicization of climate issues, NOAA produced tables of temperature, pressure, mean free path, and many other parameters as a function of altitude for a standard atmosphere with the appropriate concentrations of N2, O2, argon, CO2, neon, helium, krypton, xenon, methane, and H2. No IR-absorption effects were considered and the main greenhouse gas, water vapor, was actually not included in the calculation. At sea level, the temperature of the gas was calculated to be 288.15 Kelvin. At an altitude of 5000 meters, the calculated temperature was 255.68 Kelvin, very close to the 255 Kelvin temperature which is the black body temperature that Earth appears to have from space. This is the effective altitude at which radiative cooling of the Earth occurs. Below this altitude of about 5000 meters, other effects cause the surface of the Earth to be warmer. The Greenhouse Gas hypothesis people say it is because IR long wavelength radiation emitted from the Earth's surface is absorbed by greenhouse gases such as water vapor, CO2, and methane and half of that is re-emitted back to the surface, causing the surface to become warmer by 33 Kelvin or 33 Centigrade. But, the same table, because this is important to miners, gives the results of the calculations for altitudes below sea level. In addition to the deep mine effect, the reason that the Dead Sea has such high temperatures is because at that altitude of -413 meters, the calculated atmospheric pressure induced temperature is about 2.68 Celsius warmer than it would be at sea level! The temperature from the NOAA tables at -5000 meters, the same change of altitude from sea level as sea level is from the effective black body radiative altitude of +5000 meters, the calculated gas temperature is 320.68 Kelvin. This is 32.53 Celsius warmer than the temperature at sea level. This is about equal to the 33 Celsius warming attributed to the Greenhouse Effect. However, this effect has nothing to do at all with IR radiation, it is due only to the pressure change in the gas mixture of the standard atmosphere used in the calculation. Charles, you say (and I agree) that the Earth’s average temperature has been empirically measured to be about 288K at ground level and about 255K at 5000 meters altitude, this latter figure being equal to the theoretical ‘black body’ Earth temperature calculated according to Stefan’s Law. Consequently, the task now is to account for why there is a 33 degC difference in temperature from ground level up to 5000meters as the average IR flux of 240W/m^2 of IR energy from the Earth’s surface flows back upwards. This has to be explained even before we start apportioning blame for future man-made GHGs because we must not lose sight of the fact that (almost all of) this 33degC rise must have a NATURAL explanation! In logic, of course, the warming MUST be due in some way to the atmosphere. I have seen no other hypothesis put forward, have you? So the big question, over which warmists and skeptics still disagree profoundly, is how the atmosphere creates this 33degC warming effect. The warmists think that the additional warmth at the surface is due to so-called greenhouse gases, principally H2O, CO2, CH4 and N2O acting like a blanket, making it harder for the Earth’s IR energy to escape upwards, and consequentially (and consistently with Stefan’s Law) requiring a rise in surface temperature to establish the necessary radiative balance. And it’s not really such a bad theory, huh? I am not surprised that this was where all the academic work began 30 years or so ago (it must have been a really exciting time academically for Hansen et. al. back then – helping to save the world is never a bad existential raison d’etre) leading inexorably on to the 20 or more computer models that now grace the world stage, predicting an alarming warming of up to several degrees over the next 100 years due mainly to the burning of fossil fuels.. So what motivates us skeptics to think that this GHG warming theory must be flawed? Well as we all know there is, for the warmists, one very inconvenient empirical observation: over the last 160 years of relatively reliable instrumental measurements, the Earth has only warmed at a rate of about 0.6degC per century. This modest rise in the face of warmist alarmism should alone give all normal people pause for thought. But somehow the world at large has got swept along, whipped up into a frenzy by press reports of melting polar bears and so on, playing straight into the warmist trap. Since this 0.6degC per century figure has been largely ignored, I suppose it has been a natural human response for the skeptics to try to bolster their (already cast iron) case by putting forward alternative theories that might explain the 33degC difference. And this is where we are all in danger of coming unstuck. Sorry, but this is just completely wrong. The temperature increase as you go down into a very deep mine is simply because you are getting closer to the Earth’s molten center. The PV=nRT formula only works for an adiabatic change in P or V or both. That is a change in which heat is inable to flow in or out of the closed system containing the volume of gas under consideration. That is far from the case either in a mine or in the Earth’s atmosphere. In short this theory is a hoary old chestnut, mentioned many times in the climate blogs as an explanation for the 33degC discrepancy. In my opinion it serves only to weaken the skeptics (already cast iron) case. Nevertheless, congratulations on your general clear exposition and rational approach and long may your blog continue. Thanks for your comments David Socrates. It is always a pleasure to be able to respond to someone who makes comments under his own name. The principal reason for the 33C temperature difference between the Earth's surface is not due to an IR effect, since below about 4000 meters altitude IR is not the primary cooling mechanism of the Earth's surface. Transport processes of air convection, of water vapor transport, gas molecule collisions, and the evaporation of liquid water or the sublimation of ice play the more important roles, at least in sum. These processes in sum will support a significant temperature differential, at least compared to that of IR-absorbing gases on IR emitted from the surface. The very fact that the IR radiation equilibrium temperature with respect to space is that of the atmosphere at an altitude of 5,000 meters points to the fact that not too far below that altitude, actually about 4,000 meters, one finds the transition from the greater significance of the other near ground cooling processes to the greater effect of the IR emission cooling process. That IR emission cooling is due mostly to all of the gas molecules dominated by nitrogen and oxygen molecules, not by mostly water vapor and CO2. The greater part of the temperature differential is contained in the baseline effect of an Ideal Gas in the Earth's gravitational field. For an Ideal Gas in the Earth's gravitational field, each molecule of gas has a higher kinetic energy upon approaching the Earth's surface compared to the kinetic energy it had at the radiation equilibrium altitude of 5000 meters. This is of course since potential energy in the Earth's gravitation field is converted into kinetic energy under the conservation of energy. The temperature of the Ideal Gas is proportional to the kinetic energy of its molecules. Thus, the temperature of the gas in equilibrium in a gravitational field will increase with a decrease in altitude. This in fact accounts for the average 33 C difference in temperature between sea level and the effective IR radiation equilibrium altitude of 5,000 meters. The U.S. Standard Atmosphere of 1976 based on ideal gas calculations and having no infra-red gas absorbing radiation effects included shows this to be the case. In fact, the U.S. Standard Atmosphere does not even have any water vapor in it and that is the primary IR-absorbing gas. This ideal gas in the Earth's gravitational field provides a baseline of temperature, pressure, density, and molecular speed or kinetic energy with altitude. This equilibrium condition is perturbed by water evaporation and transport and by air convection generally. It also has small perturbations due to IR-absorbing gases, but the IR-absorbing gas effect is small compared to the usual 33 C temperature differential commonly claimed for it in naive catastrophic greenhouse gas theory. In fact, the primary effect of IR-absorbing gases is to moderate the temperature difference between day and night. Despite the seeming implications of the U.S. Standard Atmosphere, the effect of the Earth's gravitational field on the atmosphere cannot be as large as 33C. It is much smaller, but it is a warming contributor. There is no radiative equilibrium problem of 33C in fact. The radiative equilibrium due to the Earth's emissivity being about 0.7 is only about 9C below the average measured temperature. That 9C is made up by some combination of the gravitational warming effect, the high heat capacity of rock, soil, water, and the lesser heat content of the lower atmosphere with slow heat transport, heat from the Earth's core, radioactive decay, debris from space entering the Earth's atmosphere, tidal effects due to the moon-earth gravitational field, the solar wind, and interactions of the solar and Earth magnetic fields. My colleague Peter Ward and I have found a previously unrecognized source of global warming that does a much better job of explaining the variations in global temperature, not only in recent time, but also throughout the Phanerozoic. The source is ozone depletion, which is caused by the release of halogens by non-explosive volcanoes and, most recently, by chlorine from CFCs. Since the Montreal Protocol has banned further production of CFCs, we have already ended anthropogenic global warming. We attribute the warming of 2014-15 to the massive eruption of Bardarbunga volcano in Iceland, the largest effusive volcanic eruption since Laki in 1783. We have published a new book on this, and a website, WhyClimateChanges.com. We would welcome your comments.